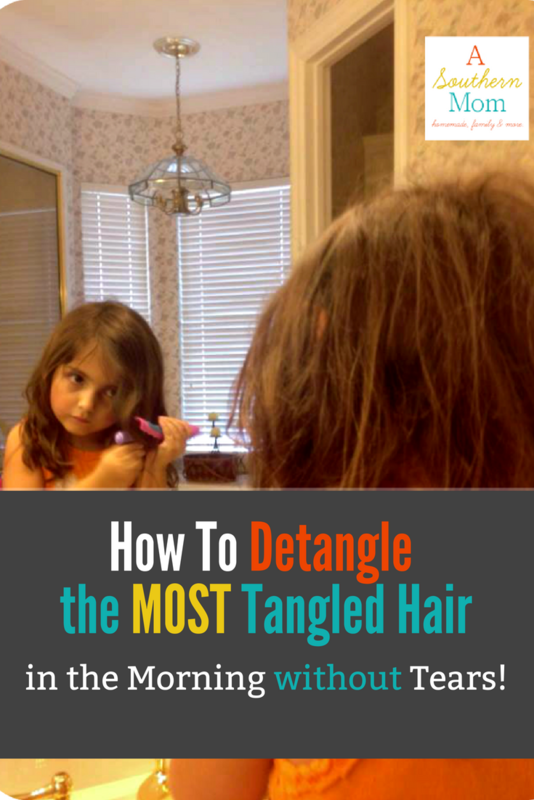 Does your daughter have the most tangled hair you have ever seen? Do her hair tangles make for stressful mornings every single day? Would you love to find a more gentle and simple way to deal with those tangle monsters that seem to creep up over night? I’ve always been slightly tenderheaded, but I might as well have concrete for a scalp in comparison to my VERY tender headed daughter. She is NOT a fan of the ol’ hairbrush and even though she has mainly straight/slightly wavy hair she still wakes up every single morning with a giant birds nest of tangled hair in the back of her head. So even though the rest of the day is fairly knot free, in the morning we have a real BEAST to deal with. Have we tried braids? Yes. She sleeps like a wild animal though and NO braids have ever made it through to the morning. Can you give her a bath in the morning. NO. I like my sleep. So does she. Why is her hair long? Why not just cut it? Oddly, her hair gets even WORSE the shorter it is. The knot starts up closer to her head. Which makes for an even more tearful endeavor. The longer her hair is, the lower on her hair the knot begins and I can hold the hair above so it doesn’t pull on her scalp as much. It might not look THAT bad…but sadly…this was AFTER trying to comb through it. Thankfully, we aren’t having horrible bad hair days much anymore now that I have stumbled on to a system that seems to work very well for detangling my daughter’s hair. Your results might vary, but this is what works well for us. We use both shampoo AND conditioner on my daughter’s hair. The shampoo is used on her scalp and the conditioner goes on her ends. If I put conditioner up any higher than shoulder length, her hair tends to get a bit too greasy too quickly. We used to just use shampoo. However, the conditioner is really essential because it makes her hair much softer and more manageable. We love this shampoo because it also takes care of flakes/itchy scalp and Tea Tree Oil has the added benefit of repelling lice! A must have for elementary school students. We use the conditioner too and it’s lovely. We ALWAYS either comb her hair with a Wide Tooth Comb (her and I both use this: Cricket Ultra Smooth Hair Conditioning Rake Comb infused with Argan Oil ) or we use my new favorite brush in the whole wide world…the Wet Brush (more on this in a bit). I find that combing through her hair while wet helps at least a little bit. It doesn’t prevent the back of the head birds nest, but it does prevent some of the tangles that occur on the sides of her head. I don’t use detangler spray anymore. I mean, I have it in the house, but I find a leave in conditioner works better and helps me to work out the back of the head knot a lot better. I spray It’s a 10 miracle leave -in on the big knot and let it sit for a minute or two every morning. I’m not going to lie…this stuff is pricey. However, I’ve had the same bottle since March and I’ve barely made a dent in it. I was going through detangler (which weighed down her hair and made it look greasy) by the gallon before finding this stuff. It’s awesome and I use it on my own hair too. Recently, we found the Wet Brush. It was actually an FFF reader (my other site) who mentioned it to me and I looked it up. Because it’s an Add On item on Amazon, I had to wait until I had $25+ worth of purchases to order it. Because I’m cheap…it took me awhile to make a purchase over $25 😉 . When we got it though, it was like MAGIC! Finally our hair care routine is (almost) tear free! I’m convinced some of the tears nowadays are just the product of having to hold still (I mean she is only 4*!). *UPDATE: She is now 7 and this is STILL the routine we use! She can do a lot of it herself nowadays! 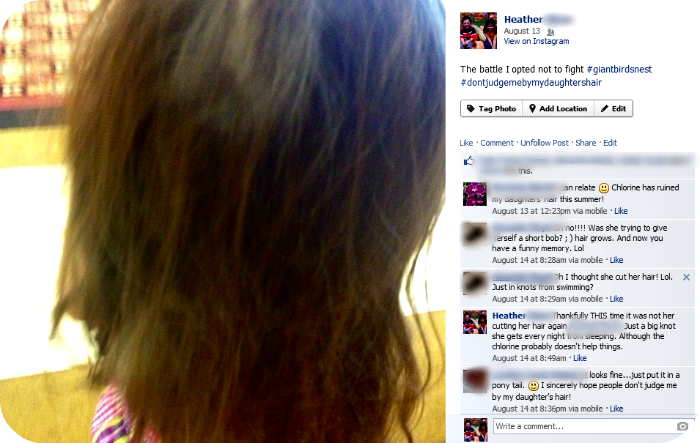 Otherwise, we have really turned a corner on hair care with my daughter. Do you have tearful hair brushing in the morning? Would you consider trying the way we do it or do you have any suggestions for us? Comment below! My daughter has really thick, long curly hair. I’ve got to give this a try. Piper is nearly 9 and we’ve just fought it all of her life. I’m an Amazon Prime member, so I’m all over this! The reviews I read of the wet brush with curly hair were nothing short of amazing! I hope it works out for you! Come back and let me know! These are some great tips! I absolutely hated having my hair brushed as a kid…I was such a tenderhead too. My poor little girl has the same problem except her hair gets a little bit curly! My daughter has incredibly thick, nappy hair (we’re Caucasian, btw) and we have no idea where she gets it. My daughter also sleeps like a wild beast (haha, I could totally relate to that one!) and every morning, her hair is one solid, giant rats nest. We’ve kept her hair really short since she was an infant because of the wildness that is her hair, but others have told me I should try letting it grow out to tame it, and I am noticing a difference, with the tangles not only being lower and easier to manage, but also with her hair weighing itself down a bit more. It’s nearly chin length now. I’m going to have to try the wet brush to see if it’ll make a difference. The one product I have tried that has been a miracle product for us (after trying about a bazillion different hair care products on my poor sweet 4-year-old), is “Yes to Carrots leave in conditioner w/ argan oil” which I buy at Target. I’ve had the same bottle for 9 months and it’s still about half full. When I add this to my daughter’s hair after I spray it down with water, it actually takes on a semblance of looking like healthy, tangle free hair. I’ll take all the advice I can get because this non-girly girly who has never spent more than 10 minutes on her hair on the best of occasions, has to spend about 15 – 20 minutes in a tearful hair battle every morning. That said, however, as often as I’ve been envious of all those other little girls out there with “normal” hair, I so love my daughter’s crazy ‘do. It goes with her tenacious personality, and when I pick her up at the end of the day and her hair is just as insane as it started out early in the morning (she must roll around on the floor at preschool or something! ), I have to smile and give her a big hug because I love every square inch of her. I’ll still do all that I can to avoid the battles, though! I have a feeling I’d fall in LOVE with her hair if I saw it! I’ll have to try that leave in conditioner! When we run out of our It’s a 10 since it is so pricey! Thanks for the tip! I hope that the wet brush can help you out! It’s been such a great thing for us! What”s so special about the cricket comb? I’m actually reading this for myself because in growing my hair out I’ve found that the hair along my collar gets extremely knotted and I’m tired of ripping and tearing all those strands I worked so hard to grow when attempting to comb out! I use just a basic/cheap wide toothed comb in the shower and a conair wet/dry detangling brush fresh out. Just wondering why you suggested this specific comb. I invested in a Mason Pearson brush for dry hair but this comb seems inexpensive. If you think it’s worth it I might think about this too. That’s interesting you say that layers helped, because I’ve considered some slight layers for my daughter. She’s only 5 though, so it feels strange to be considering that! We used to have the same problems every morning & every night with tangles & not only tears, but lots of screams (my daughter is very tender-headed!) We learned to use conditioner also, but we also stopped using the children’s conditioner (and definitely not use the 2-in-1) & started using an adult shampoo & conditioner. But what was the most absolute break-through was the Wet Brush, which I learned about on your FFF site. We have used it night & day for the last week & daughter continues to exclaim that “that brush is just the best brush ever!” We don’t have to use detangling spray, & there is definitely no more screams & tears! I never thought a “gimic” would ever work – but this one does! Awesome! I’m so glad. Yeah, I mean it just looks like a normal brush right? But there is something magic about it. I love it too! I have a ton of very fine hair that tangles easily. I also use a wet brush and It’s a 10 but I find the Its a 10 LITE in the white bottle works even better for me. I was the same as a kid and still am now. I wouldn’t let anyone brush my hair after awhile (not even my mom) and on bad days with the giant rat nests that covered the underside touching my neck I would be that kid who would take scissors to it. When I reached high school I found WEN shampoo. My goodness did it become a life saver. I have natural thick, wavy hair and it is a killer! Layers and short hair only made it worse and I was so happy I had this as a present for Christmas. One suggestion, do NOT use it as a shampoo. I think it’s too heavy and can leave your hair looking to greasy. My saving grace was using a pea sized amount in the shower after my normal conditioner, rinsing it out thoroughly. And then taking another tiny amount and only putting it on the ends of my hair and in the worst areas and leaving it on as a leave in conditioner. Like I said a small amount is better, otherwise your hair looks greasy the next day. Since doing this I haven’t had nearly as many horrible rats nests, though they do appear sometimes. I used WEN for awhile and had the same issue of it being horribly greasy. So you use it kind of a like a deep conditioner too I guess? Yeah I used it as a deep conditioner only and it did wonders. Thank you, thank you, thank you for this post! As a child, I was a little demon to my Mom in the mornings when she would try to do my hair. I’d scream, I’d cry & yes, sometimes I’d spit and throw tantrums (terrible, I know). Now I have a 6 year old daughter who is the same and mornings are awful when it comes time to do her hair. It’s to the point where I just sort of smooth her knots into a ponytail, throw in a bow and pretend I accomplished something (also terrible). I will try out some of these suggestions. I already use both shampoo and conditioner and in the same places as you, but I’m pretty bad at brushing her hair before bed. So I guess it’s time to start! Every time I went to a salon as a child my mom always asked to get my hair thinned out a little because of how ratted it could get. You don’t lose any length but it is more manageable and less heavy. Want to try the wet brush for sure! I love the wet brush!. I am biracial with thick, curly hair and it glides through my hair wet or dry. It’s a god send. My daughter’s hair (she’s 2) is thick and long with big ringlets at the nape of her neck that get really difficult to comb through. The wet brush is the only thing she will let me touch her head with. The wet brush is the only brush my daughter will let me use as well! My 5 year old daughter has long fine hair. I’m still getting used to her fine hair and looking for the right products to detangle and condition it well. We just got satin pillowcases and I’m hoping that works for the morning bed head tangles. Also, we love the wet brush and you can get them half off at a lot of TJ Maxx stores. I’m so glad I found this post. My 4-year-old daughter looks just like yours in the picture every morning. It is literally a crazy birdnest every morning. I love the hashtag #dontjudgemebymydaughtershair Besides brushing it haphazardly, she never lets me do anything to do it. No ponytails or braids. Just down. Going to get her a Wet Brush and some leave in conditioner and see if that helps. Thanks for the advice! !